An emotionally resonant, tight and grooving set of originals that takes the warm, enduring sounds of that era and makes them jump as fresh, contemporary blasts of creativity, the album was co-produced at Parlor Studios in New Orleans by Charles and Tracey Freeman,  two time Grammy Award winner for his work with Harry Connick, Jr. and Rebirth Brass Band. The tracks were recorded live using period specific gear and mics with Charles’ pick of the best musicians on the planet,  starting with George Porter, Jr., renowned bassist for The Meters and including longtime Hall & Oates musical director and guitarist Shane Theriot, drummer Doug Belote and percussionist Michael Skinkus, with horns arranged by Mark Mullins, trombonist for New Orleans brass funk rock band Bonerama. 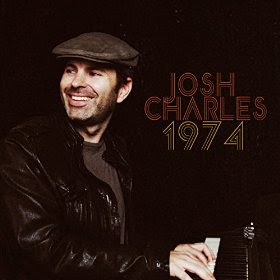 Josh Charles brings an eclectic background as a recording artist to the sessions of 1974, including recordings for Columbia Records/Sony Music Entertainment, Island Records, Elektra Records/Warner Music Group. He has produced/co-produced and written/co-written seven albums, including his most recent “NOtown” release Love, Work & Money. In-depth television profiles of Charles and his music — including his philanthropic efforts to help rebuild New Orleans after Hurricane Katrina — have appeared on “Good Morning America,” “The Tavis Smiley Show,” “CNN” and other outlets. He has also been featured in national print and digital media, including “USA Today,” “LA Weekly,” “The Huffington Post,” “Keyboard Magazine,” “Voice of America,” “Electronic Musician,” and others. Josh was the first musical artist for Casio, serving as the national spokesperson for Casio’s Privia brand of digital pianos and appearing in the nationwide marketing campaign. He is also endorsed by Gibson Guitars, UVI software and ASTON Mics. Charles moved to Nashville in 2013 to further develop his career. There he began collaborating with hit songwriters including John Oates, Milton L. Brown, Sonia Leigh, Jeff Cohen, Bridgette Tatum and others in both the country and pop/rock formats. In 2014, Josh also began producing and co-writing with traditional big band singer Steven Davis. Their prolific partnership has led to five albums of original songs and the recently released album of standards, The Way You Look Tonight. In addition to working with Dr. Dre’s Aftermath production team, Charles works with many up and coming artists.